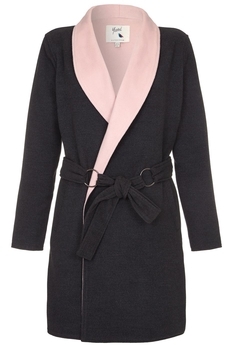 Yumi London, Wrap Short Coat with Eyelet Belt is designed for a relaxed silhouette with contrast shawl collar neckline, side pockets and eyelet detail self-tie sash-belt. Made from mid-to-heavy weight double-sided fabric is approx. 92cm in length and has no closing. Winter collection. Composition: 100% Polyester. Color: Dark Grey.